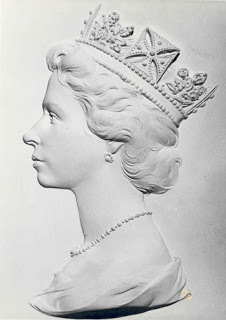 Arnold Machin produced this iconic plaster cast of H M Queen Elizabeth 11. It is now 52 years since the design was first used on the 4d value which was first issued in June 1967. Long may it continue to enhance our favorite definitive stamp. This Web Log is produced by Roy Simpson and our guest writer Larry Rosenblum of the USA. Please feel welcome to leave any constructive comments. RMS Paper known as (Royal Mail Standard ) or (Specification) This is the paper currently used at Dunstable for all current printings , Known in certain circles as ATN (c) This has a cream PVA gum and is dull in appearance, developed and designed by order of The Royal Mail to get near to that of HS2 used previously by Harrison's at the High Wycome plant. TR3: This is the main term for paper used by Royal Mail for the Byfleet printings, there are 3 types found to date with variations of OBA (Optical Brightening Agent) in the coating. These are listed and known to specialist collectors as Dull, Intermediate and Bright papers listings are given secondary codes by collectors as - d, - i, and - b.
HSC is another paper used at Byfleet, a single paned dull paper with Layflat gum (imported from Jon Enschede of Holland). Due to the fact only single panes could be used on the ATN press, only no dot cylinder blocks were available from this printing. These are all of the dates recorded on site to date, it is quite possible that some dates exist and have not been recorded. The dates appear in order of Value / colour of stamp, Cyl and Phos numbers, Paper and gum. All are cylinder D1 D1 unless stated. No Dot and Dot cylinder blocks were available on most printings (x) denotes that the dot block does not exist. Previous on site listings of this same information will eventually be deleted so that we can now have this information to hand and update it on one single page. A permanent link will be added to this post at the top left of the blog. Please note Dunstable printings RMS paper (from 22.04/05) and Self adhesive security (slit) stamps will be recorded on separate pages. A link to the pages will be added here in due course. I will not be recording Country Pictorial definitive dates at this time, but may do in the near future. Thanks go to the MCC catalogue, the Bookmark Journal, Ian Billings and Richard Parsons for their listings and also their help and advice. This next issue was a stop gap short order (emergency printing) ordered by The Royal Mail from Jon Enschede of Holland. What was also interesting with this particular stamp is, it was printed with just one centre phosphor band. The Enschede 35p value only remained on sale for a short time until the De La Rue factory was operational, then a further reprint was issued (again with one CB) with the De La Rue logo.